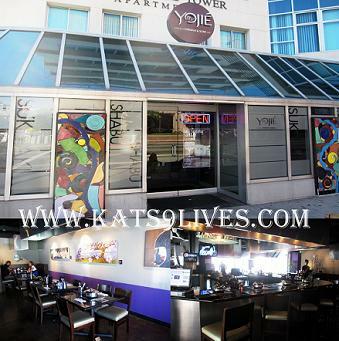 Kat's 9 Lives: Yojie Japanese Fondue & Sake Bar : Modern Shabu-Shabu? Yojie Japanese Fondue & Sake Bar : Modern Shabu-Shabu? Tired of the same old Shabu Shabu? Unfortunately your friend or family wants Shabu Shabu but you don't? Come to Yojie Japanese Fondue & Sake Bar where both of you can be satisfied. They not only offer shabu shabu they also offer Sukiyaki. I actually don't think I have done Sukiyaki before so this was a very interesting experience. The best part is Burumun, aka Gourmet Pigs, had a certificate. Upon entering I saw that they have a wonderful deal on Sunday where you can have an ENDLESS Sangria for $5. Why oh why did we happen to go on Saturday! lol The inside is very nicely furnished in a sleek dark decor that exudes modern elegance. I even love the contorted glasses. They just looked so adorable in the light that I had to share the photograph! So what is Sukiyaki you might ask? Here they serve the Kanto, Tokyo, style. The broth is a mixture of soy sauce, sugar, and mirin. It is almost like Shabu Shabu where they bring you out the thinly sliced meat and a big plate of vegetables to dip. Once the broth is hot enough you use the tongs to pick up the meat and start "swishing" away. I prefer my meat more on the rare side so I barely keep it in the heat. A big difference between Sukiyaki and Shabu Shabu is the sauce you dip it in. They give you a bowl of raw egg and you are to mix/beat it thoroughly to get a smooth even consistency. You can choose to dip the meat before you cook it or immediately after it's cooked where the egg will help cool down the meat. I thought the egg went surprisingly well together and began to dip all my meats on this side. The sauce for the Shabu Shabu side is your normal Ponzu and Sesame sauce along with the grated Daikon, Garlic, and chopped Green Onions. What's most important about Shabu Shabu is the sauce because it is basically cooking the meat in water so all the flavor comes from the sauce. For dessert they offer Chocolate Fondue or with a twist, Green Tea Chocolate. They even offer a sugar free green tea chocolate for $3 more. We decided to get the Fruit and Pastries combo with Bananas, Strawberries, Poundcake, Rice Crispies, and 2 flavors of Marshmallows. The strawberries were sweet but my favorite is always the rice crispies! It's interesting that the green tea chocolate had a denser consistency and solidified at a quick rate. Chocolate fondue is always a great way to finish off the meal. We turned a healthy meal to unhealthy too!